This is the last and rarest Pac-Man arcade game. It’s a 3D, first-person game, it’s played with a Visette virtual reality visor and a gyroscopic joystick. 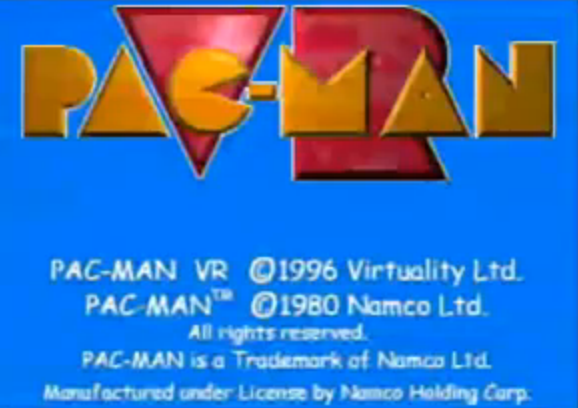 It was made in 1996 by Virtuality Entertainment, its copyright currently belongs to Arcadian Virtual Reality and runs on an Intel 486-based PC. An August 17, 2008 press release states that Arcadian Virtual Reality will liquidate all currently held assets, including the highly regarded intellectual property rights of Virtuality Entertainment, before January 2009 (see snipurl.com ). Will this mean there is a chance to have it dumped and emulated soon?